If you’ve been to any of the larger genealogy conferences, chances are you’ve seen Maia’s Books in the exhibit hall. Proprietor Martha Mercer is currently making the long drive from Ohio to Utah—over 3400 miles round-trip—for the upcoming RootsTech conference. In the hustle and bustle of packing up boxes before she left, she graciously allowed me to interview her. Shelley: Tell me a little bit about Maia’s Books. When did you start the business, and why? What kinds of things do you carry? Martha: Maia’s was established in 1994, after I went to some genealogy conferences and was disappointed in the books being offered. They were mostly research guides and indexes, whereas I was more interested in social history—how people lived, why they made the decisions they did, the economic and social pushes that caused change. I wanted to sell books and items that would deal with social history, start conversations between generations, and help genealogists stir interest with their own family members. 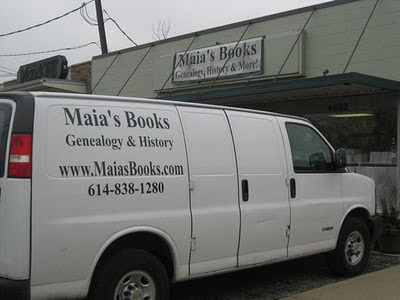 I consider Maia’s a general interest bookstore for genealogists and historians. Rather than specializing in a single area, we carry a wide selection. We have books on regions and states, time periods, ethnic groups, cemeteries, photography, religion, wars, and European countries. And of course we have how-to and reference books for just about any type of research. Another big part of Maia’s inventory is maps. Maps help people see where their families lived, their migration paths, and how geography affected their choices. We have a selection of magnifiers to help read old records. And then we offer some items, such as paper doll books and cookbooks, to help people of different generations connect with their heritage. 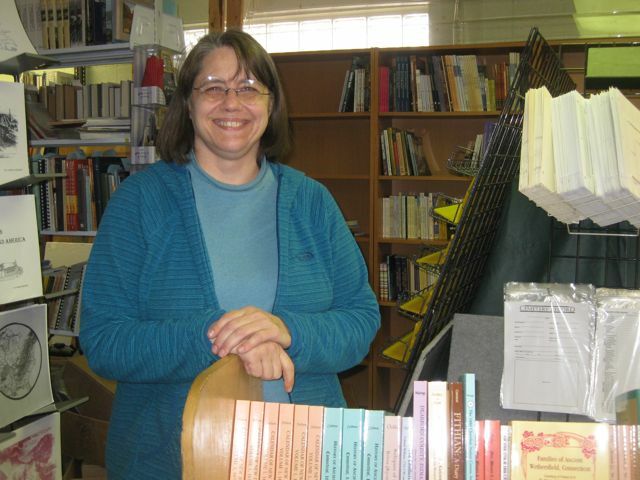 Shelley: Who buys your books, and how do they find you? Are conference sales a big part of your business? Martha: Conference sales comprise the majority of our business, with mail order sales second. People find us in the exhibit halls and through our website, www.MaiasBooks.com. We travel to about 20 conferences a year. Last year we were in Wisconsin, Florida, Texas, Illinois, Ohio, Virginia, Missouri, Kentucky, Indiana, Pennsylvania, South Carolina, and New England. Our mail order customer base is worldwide. I just shipped something to Australia yesterday. One of the most interesting orders I’ve had was for a book on Scottish whalers for a customer in Kenya. But that shouldn’t be too surprising, because people migrated everywhere. We’re also one of very few genealogy bookstores in the U.S. with a retail storefront, and we do a small retail business in Columbus. Shelley: This will be your first time at RootsTech. What makes you excited about going? Martha: Everything on their program looks interesting to me because it’s learning how to use tools for processing information. I’m excited to learn about technology that I can apply to whatever I’m doing. The first RootsTech was publicized in advance more as a conference for developers, so we didn’t go. But at every conference after that, I had customers asking, “Why weren’t you at RootsTech?” and telling me, “You need to be at RootsTech.” People were thrilled with it. So really, I feel there’s a lot of customer demand for Maia’s to be there. Some people made excellent points during the recent discussion of whether print book dealers shoud have a place in the RootsTech vendor hall. Technology is great, but that doesn’t mean that print materials are no longer relevant. And while it’s important that the programming at RootsTech is geared toward technology, that doesn’t mean you need to put those limits on the vendors. It’s good that the conference planners were responsive to their participants. We’re excited to be participating in an event that promises to be twice as large as most national conferences. 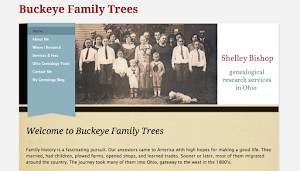 Shelley: What role do you think books and booksellers play in genealogy today? Do you think books remain important in an increasingly digital age? Martha: I think there will always be an appeal of holding a tangible object in your hand. What shape that takes depends in part on the individual. Some people will continue to prefer books, and some, especially those growing up with technology, may prefer an e-reader. A lot of people seem to fall in-between and use both, depending on what the book is and what they want it for. The industry as a whole is in a state of transition right now. I expect, for instance, to see print-on-demand services grow. But I don’t see books becoming just a novelty item. I think books still have a great deal of relevance for today’s genealogists and historians. A special thanks to Martha Mercer for sharing her time and thoughts with me. If you see the Maia’s Books exhibit in the vendor hall at RootsTech or another conference, stop by and say hello! Thanks, Judy, glad you enjoyed the interview. You're right, her store is a lot of fun to browse around! Great interview, Shelley! I loved finding Martha and her books at the FGS Conference in Springfield. She was one of the highlights of the exhibit hall. 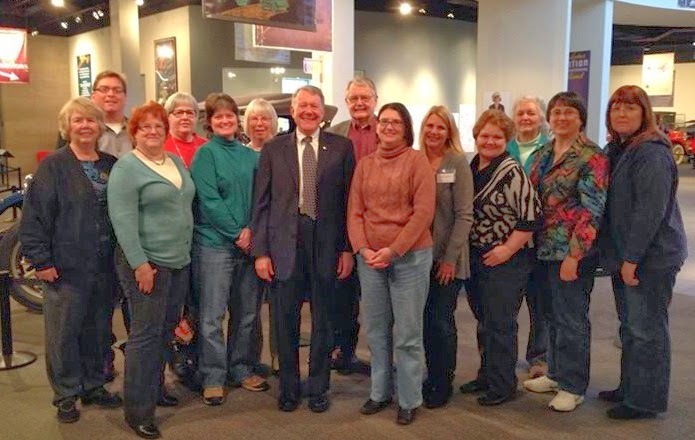 Martha and her book collection were a wonderful addition to RootsTech 2015!